U.S. 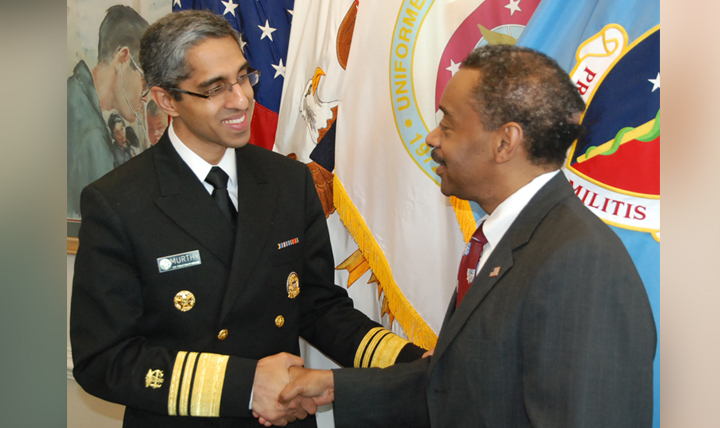 Surgeon General Vice Admiral Vivek H. Murthy meets with Dr. Jonathan Woodson, assistant secretary of Defense for Health Affairs, at the Pentagon on March 11, 2015, to discuss the Military Health System’s critical role in support of the National Health Strategy. eaders of the Military Health System met with the newly confirmed U.S. Surgeon General at the Pentagon on March 11. Dr. Jonathan Woodson, assistant secretary of Defense for Health Affairs, and Air Force Lt. Gen. Douglas Robb, director of the Defense Health Agency, discussed military health and the MHS’ critical role in support of the National Health Strategy in their first meeting with Vice Admiral Vivek H. Murthy since his confirmation by the U.S. Senate in December 2014. The meeting gave the leaders the important opportunity to discuss the Military Health System as a strategic asset in support of national security objectives, and the important role DoD plays in supporting the National Health Strategy, especially in areas such as reducing obesity and tobacco use. 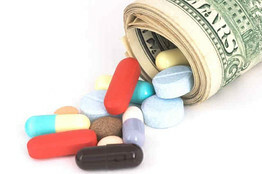 The Patient-Centered Outcomes Research Institute (PCORI) is operating in accordance with requirements of the Affordable Care Act, but the lack of a standard data model poses a hindrance to plans to develop a “network of networks” to further comparative effectiveness research (CER), according to a report from the Government Accountability Office. PCORI, a federally funded, nonprofit corporation, has established priorities and process for funding CER. It has awarded 360 contracts totaling $670.8 million as of October 2014. Yet while the planned National Patient-Centered Clinical Research Network (PCORnet) is believed to have the potential to significantly improve the ability to conduct CER, it faces various challenges. Plans call for PCORnet to combine the resources of 11 Clinical Data Research Networks (CDRNs), such as the National Pediatric Learning Health System from the Children’s Hospital of Philadelphia, and 18 Patient-Powered Research Networks (PPRNs) formed by patient groups, such as the Epilepsy Foundation’s Collaborative Patient-Centered Rare Epilepsy Network, FierceHealthIT previously reported. PCORI officials and other stakeholders, however, “expect that the process of mapping data to the common data model will be slow and resource intensive because of the lack of standardization among existing data maintained by CDRNs and PPRNs, such as data from electronic health records,” according to the report. A common data model and the requirement that networks hire the expertise to address standardization are expected to work out this issue, the report says. However, uncertainty about costs and sustainability of the network remains an issue, and each CDRN and PPRN is expected to be required to provide a sustainability plan. The completeness of data is another issue. PCORI officials said that they are collaborating with other relevant organizations, including state Medicaid offices and private health insurers, to identify how CDRNs could link their EHR data to claims data, which would improve data completeness. While some early results are expected to be announced in 2017, full evaluation is not expected until around 2020, the report says. Research findings will be publicly available 90 days after researchers submit their final reports, as required by law. Another recent GAO report called for improvements in disseminating comparative effectiveness research from the Agency for Healthcare Research and Quality to avoid duplication with PCORI.